If visiting the ice caves is on your to-do list for Juneau, here’s a handy “know before you go” guide. 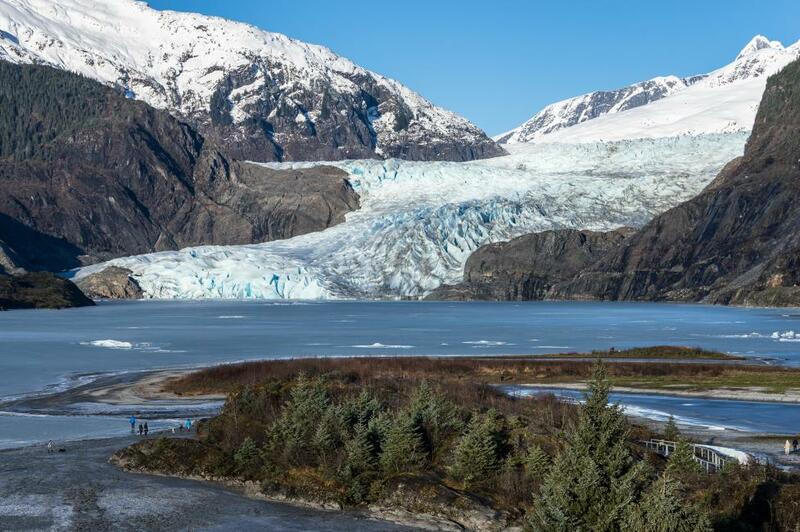 Located just a short drive from downtown Juneau, the Mendenhall Glacier Recreation Area is perhaps Juneau’s most recognized natural feature. One of the 38 glaciers that emerge from the 1500 square mile Juneau Icefield, the Mendenhall makes its 13-mile course toward sea level, terminating at the north end of the Mendenhall Valley. The area is part of the Tongass National Forest. The glacier’s ice caves captivate locals and visitors alike. The stunning “glacier blue” is the result of air being squeezed from the original frozen snow and ice, so that the ice absorbs every color except blue. Melting water running under and through the glacier regularly carves new caves; over time, the caves collapse from the glacier’s retreat and general shifting. These constant forces make a trip to the ice caves thrilling and dangerous. In the summer, expect dripping water, fast-moving streams, falling rock, and unstable footing. And, because the trek involves hiking on a generally unmarked trail, hikers unfamiliar with the area can easily lose their way back. More than a dozen times each year, lost or injured hikers have to be retrieved from the area. Travel Juneau always recommends that visitors hire an experienced guide who knows the current conditions of the ice caves, has all the right gear, and knows the trails. Allow lots of time. The round-trip can be up to 8 hours depending upon conditions, and the way is unmarked and unmaintained much of the way. Be honest: are you in good enough condition to rock scramble over steep, slippery terrain over several miles and several hours? Wear sturdy, waterproof footwear, preferably hiking boots that cover your ankles. You’ll need crampons to traverse the ice. We also recommend hiking poles. Bring a safety helmet to protect your noggin from falling rock. Rock WILL fall on you. Dress in Polypro or other quick-dry/wicking layers. Weather can be fairly warm on the way out then turn rainy and chilly. Cell service is spotty. Make sure someone knows where you’re headed and when you plan to be back. Hire a guide to get you out and back safely. Travel Juneau can refer you to some great ones.